Learning how to play a musical instrument is not easy. Just like any other hobby, it requires hard work and dedication. And, of course, good musical instrument. In this article, you will find a list of the best digital piano for beginners. Doesn’t matter how good a pianist it, he or she had to start from the very fundamentals. Even though you see them playing the Grand Piano or any other fancy music instruments, most of them have started with a pretty average beginner’s digital piano. However, finding the digital keyboard that fits your needs is not always easy. That’s why articles like this one are written. Save yourself a hustle of returning something that doesn’t work for you. Let’s look at the top picks for the best digital pianos for beginners. The full list is just below that! Do You Need Weighted Keys? Now let’s get to our journey of looking for the best digital piano for beginners. When looking for a digital piano, considering the number of keys you need is crucial. And this Yamaha 88-key piano is a fantastic choice for beginners. The best part of owning this piano is the lack of an overwhelming number of features, switches, and knobs. This may sound like a drawback at first. As you keep playing, however, you’ll understand that having too many options slows you down dramatically. It’s a one button configuration digital piano. Just enjoy the flawless performance with fewer things to worry about. The sound is rich, deep, and flawless. It’s a fantastic replication of a real piano, one of the best ones out there. I should also mention that P35B is the first digital piano of the P-series, the world-famous and all-time favourite line of instruments. When you are looking into the mid-range priced digital pianos, there is nothing that’s made entirely for beginners. New piano players usually look into the cheapest options available to “give it a shot” and quit if it doesn’t work out. This Yamaha is of incredible quality and is suitable for piano players in various skill groups. The only turn off for more advanced players may be the lack of extras. Other than that, it’s a great musical instrument for everybody. Casio is the other well known musical instruments’ brand out there. It’s digital piano models are believed to be the most reliable in the piano industry. 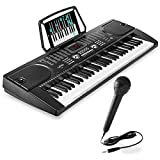 This Casio Privia offers fantastic audio and sound feel which is so essential for the beginners, as they kept being interested and engaged in playing the piano. 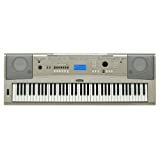 The keyboard is enhanced with SHA technology which makes the keys render a lot easier and lets the beginner piano players understand key velocity a lot better. Moreover, the design is both soft and slick at the same time. 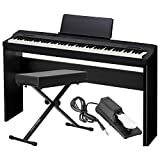 The digital piano also includes a USB connector and an amplifier that provide excellent connectivity and resonance. It’s not a cheap digital piano knockoff that you can find on AliExpress. It’s worth its price regarding quality and durability. And, of course, you pay a little more for the brand. As any other 88-key digital piano, it’s more expensive than the fewer keys versions. As you add more keys, it gets more complicated and fragile, but also more similar to a real authentic acoustic piano. The PX-160 utilizes Casio's famous Tri-Sensor Scaled Hammer Action II keyboard. This action features new simulated Ebony and Ivory textured keys for an incredible feel and its three sensors capture the dynamics of a performance with unparalleled speed and accuracy. Casio's proprietary Hammer Response feature takes into consideration the speed at which different sized hammers move inside an acoustic grand piano relative to the velocity the keys are played. The PX-160 also features newly developed string ensemble sounds. These rich stereo strings sound wonderful by themselves or layered with the PX-160's grand pianos, electric pianos, harpsichord and more. 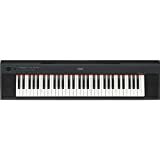 The electric pianos have also been updated providing some dynamic sounds derived from Casio's award winning PX-5S stage piano. The PX-160 provides split and layer capability allowing you to play bass in your left hand and have two layered tones in your right. For quiet listening, the PX-160 now has two headphone outputs which are located on the front of the instrument and for those who are performing with other amplification, the PX-160 also features 1/4" left and right line outputs on the rear panel. The PX-160 continues Casio's tradition of providing "class compliant" USB connectivity on Privia digital pianos. This allows the PX-160 to be used with Mac or Windows computers without the need for downloading drivers. Remember how it was mentioned that with Casio and Yamaha you also pay a little extra for the brand. Well, that’s true. Let’s look at Korg B1 digital keyboard, for example. It has 88 hammered weighted keys and a fantastic sound system that turns every note into a flattering tone. If you haven’t been in the music industry for a while, you probably wouldn’t even know what Korg is off the top of your head. The only thing it lacks is the power of the brand. Why is it great for beginners? Again, the price. If you can save a couple of hundred bucks by not going for the fanciest brand, why not? It also has eight different sounds to give you exposure to various tones. Unlike Grand Piano digital replica, Korg has been made from scratch. A lot of beginners expect it to sound unnatural but over and over again it proves them wrong. 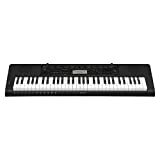 With vibrant sound, classy design, and quality build, Korg B1 digital keyboard is an excellent choice for beginners. Yamaha pianos have always been on the top of the food chain. They are known among beginners and professionals, old and young. And it’s understandable. When you buy a Yamaha, you are not worried about the quality and reliability. Everything is always top-notch. And if it’s not, excellent customer service takes care of everything as soon as possible. You can’t go wrong with Yamaha. YPG-235 series is a 76-key digital piano that offers incredible features for a decent price tag. The panel is incredibly easy to understand, and the workflow pattern is incredibly smooth. You get over 160 preset styles with 500+ voices features and 30 preset songs to enhance your practice time. Moreover, the CD-ROM included in the package comes with around 70 extra songs to play. This means more fun when practicing. You can also connect it to your PC or laptop. If you are producing music, it’s a good idea to purchase a MIDI keyboard to simplify the workflow. Or buy a keyboard with speakers built-in to play the piano. Well, with this Yamaha digital piano you can do both. Even though the keys on this portable Grand piano do not give you the same feel as the keyboard, it’s still an excellent digital piano for the price tag it comes with. Great for not just beginners, but experienced piano players as well. 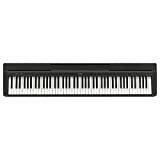 If you are not looking for anything extra fancy and don’t have that much space in your room, house, or apartment, a 61-key digital piano will do great. It’s a versatile musical instrument that will help you a lot along the way. Is it okay that it’s not a full-sized digital keyboard? It’s mostly designed for beginners who don’t really need 88-keys digital keyboards, as those are used for more advanced pieces of music. It also comes with a microphone and a few nice sampling options that are really fun to use and play with. And, as you can expect from Casio, the manual comes as more of a handbook that will let you understand how everything works. Don’t I need all 88 keys to play the piano properly? That’s not always the case. Actually, most pieces can be played with 61 and even 49 keys in some cases. Therefore, having 88 keys is not a must. It does make the keyboard look more professional, but that’s about it. You save a lot of space on your desk or in your room because it’s considerably smaller. Moreover, digital keyboard with fewer keys is more comfortable to transport and less fragile. That’s very important to beginners that don’t have a music studio yet. This digital piano’s design is flawless, and it comes with a number of features that both beginners and professionals will find surprisingly handy. It also only has 61 keys, so it’s a better fit for smaller places and is easy to travel with. The keys are not weighted, but that’s the only drawback you can think off. Moreover, it comes with a few pleasant surprises. What’s unique about this keyboard? Well, the “Dance Music Mode” that Casio has developed is quite neat and fun to play with. The mode lets you choose in between 50 fantastic built-in dance rhythms. On top of that, you get an engaging step-up lesson system, 400+ tones and over a hundred rhythms. To keep the piano players engaged, Casio also provides the integration with the free app called Chordata Play. Does it cost a fortune? This is actually the best part about this digital piano for beginners. Even if it didn’t have any extra features available, it would still always be in demand. With everything this digital piano has to offer, you can’t find a better bang for the buck on the market. Casio has once again gone above and beyond with Casio CTK 3500. As you know, Casio always keeps surprising consumers by overdelivering everytime they release a digital keyboard or piano. Casio LK-175 is not an exception. It comes with 61 keys which are not weighted. So if you plan on getting a real acoustic piano in the future, that’s probably not the best choice for you. What are the main features of this digital piano? Casi LK-190 is somewhat similar to the previous one and comes with 400+ tones, 100 rhythms and the step-up lesson system. Additionally to that, you get sixty songs built-in, which is excellent for practice. On the top of all that, the keys light up! It’s a sweet feature for most visual learners and beginners, as you can see which keys are supposed to be played. The light-up keys we talked about earlier can also slow your progress if not appropriately used. Do you want to eventually learn to play piano by ear, right? If you rely on your visual memory and memorize the patterns instead of developing your muscle memory, you will slow the progress dramatically. So just don’t try not doing that. Casis has introduced the Dance Music Mode that lets you create, mix, and mesh EDM easily with over 50 different styles. The lower keys act as percussions such as kicks, snares, hats, and bass. And the button and switches above let you add a bunch of effects and filters to make your beat punchy, catchy, and unique. Considering the price, it’s one of the best digital pianos for beginners on the market right now. If you’ve never heard of Alesis, shame on you! On a serious note, Alesis is a great brand that offers excellent quality products for a smaller price than Casio and Yamaha would. Of course, these Japanese brands took their time building the autority, and it is paying off. But don’t let this trick you into thinking that all new brands will be low quality. Let’s talk about the digital piano now. Alesis Recital comes with 88 semi-weighted keys. The keys are also full-sized which means size-wise they are identical to the acoustic piano keys. Even though this digital piano doesn’t have many preset voices, you can customize them and create your own by layering two different keys when using the layer play mode. After that, you get a rich toner output. On top of that, you can use effects and sustain pedal to adjust the sounding up to your liking at any time. You can also use the split mode to play right or left keys while the tones are still in place. The sound is excellent and as close to the natural as you can get. With 128 polyphony tones, you can go all in with your creativity. And the price tag is not scary at all. To sum up, Alesis Recital is one of the best cheaper alternatives to Yamaha and Casio digital pianos for beginners. Like most other smaller digital pianos, this Yamaha is an excellent and reliable choice for every beginner. With the ability to reset all the setting back to the factory preset with the press of one button, you are welcome to experiment with different settings as much as you want! So make sure to try 30+ polyphony tones and a bunch of other versatile options that this portable digital keyboard offers. Have you heard of the dual mode? With this unique mode, every beginner can practice along with their instructor or a more experienced pianist. The function splits the piano into two parts with two different center C notes so that you can practice easier pieces together with friends or partners. The AUX input lets you plug in any device of yours and use this Yamaha digital piano as a MIDI keyboard or a playback device instead. Definitely worth your consideration, as it provides superb quality of build and sound. The PSRE253 operates on batteries or with a power adapter. NOTE - Power Adapter is sold separately. This keyboard has one of the sleekest designs out there, and it’s lightweight and portable. Among the beginner 61-key digital keyboards, Yamaha Piaggero probably offers the best sound quality. If you like sampling, this digital piano is equipped with Yamaha famous Advanced Wave Memory. And the high-quality built-in speakers make your practice sound a lot more exciting and professional. How portable is Yamaha Piaggero? As mentioned earlier, it’s one of the most portable of its kind. With the alkaline battery that lasts for 6+ hours included, it only weighs nine pounds in total. Moreover, on and off buttons will prevent your battery from dying prematurely because of the constant and unnecessary power usage while the keyboard is idle. Overall, a great beginner’s digital piano with enough perks and features to satisfy even an experienced player. 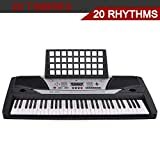 Even though apparently not as popular as the classic musical brands, The One is a great portable keyboard for beginners who just start learning the piano. It has 128+ sounds to play with, which will be great for practice. Moreover, you get the MIDI file capability, which is actually relatively rare for the lower end keyboards. You also receive 4000+ sheet music and a bunch of games and videos. On the top of all that, the device lets you record music, sample sounds and tones, and a lot more. The best thing is that they offer every beginner that decides to purchase their digital piano a free learning app for both Android and IOS users. Is this app any good? Well, you get to learn everything at your own pace within the comfort of your own home. And constant updates are free for download for everyone. It’s not quite a music tutor, but will do better for beginners, as having another person continually pointing out your mistakes is not always encouraging. Don’t forget about the manual. You need to set everything up properly to get everything out of the digital piano. The manual is clean and concise, so spend half an hour or so, and you’ll be okay. Magical LED Lighted on the keys of this 61 keyboard piano-Follow the LED light and you can play the piano in minutes. Powerful educational functions in the Free APP of the electric portable keyboard piano-professional lessons videos, fun games with learning, creative crash course and thousands of sheet music. With powerful built-in speakers and a 128-note maximum note polyphony. MIDI output and recording. Learning and mastering rhythms, tones, or versatility can be quite hard in the beginning. And it’s a lot more difficult when your digital piano doesn’t carry any of those features. Well, that’s not the case with Hamzer. Moreover, you get the ability to split the piano, with two different central C notes. If you have a partner, or you want to practice with the instructor, there is no better function to do this. You can easily track your progress with the record and playback buttons. Your ears and ego may be tricking you when you play, but later on, you can listen to the melody you’ve just played again to make sure you did a good job. And you don’t have to play it back with the built-in speakers. 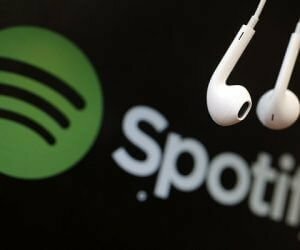 If you have studio headphones or monitors, you can always connect them to the port and have a more neutral sound with no equalization (EQ) added to it. FLAWLESS, AUTHENTIC RANGE OF SOUND: Built-in speakers offer tremendous sound, complete with 255 Timbres, 255 rhythms, 61 keyboard percussions, and 24 demonstration songs. INTEGRATED LEARNING SYSTEM: Designed for beginner to intermediate-level use, this multi-function keyboard piano features 61 standard-size keys, providing a traditional piano or organ feel for versatile learning and an exciting acoustic experience. Keyboard comes with a complete set of transparent stickers to label the piano keys in order to simplify and accelerate piano mastery. DELUXE EFFECTS & FEATURES: Ideally suited to master finger control, this portable piano keyboard allows for play of single-fingered and fingered auto-bass chords, with the capacity to select chord timbre, program/edit rhythm, as well as utilize effects such as vibrato, sustain, & ensemble. Additional features include rhythm sync and fill-in, tempo adjustment, accompanying volume, and a master volume control. RECORD & PLAYBACK, with MICROPHONE & HEADPHONE JACK: Belt out in song or discreetly practice on headphones, along with the option to record and playback for improved performance. Includes microphone with a 4' cord, audio input, output, and headphone jack. EASY TO USE & PORTABLE: Ready-to-use right out of the box, just power with 6 AA batteries (not included) and take this compact, lightweight musical keyboard on the road or to lessons, or use the US-standard 110 -120 volt power adapter and plug into the wall for extended play sessions. It’s been mentioned earlier that even though Alesis is not as popular as Casio and Yamaha, its product quality is excellent. And it applies to the lower budget digital pianos as well. This lightweight 61-key digital piano is incredibly compact and easy to use. The preset library consists of 200+ sounds that you can choose from. Sometimes it feels like it’s way more than anyone needs, but who knows? And it has some demo songs as well. Alesis Melody offers you ten preset songs, which is not a lot, but more than enough for any beginner. The songs are available in three different modes to choose from, so you get to be flexible with how you want to play them. 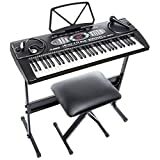 And just like with the bigger 88-key Alesis Recital, you can split the keyboard in two for a better and more fun learning experience with another person of your choice. It even has a microphone. Not a nice studio condenser or dynamic mic, but a little microphone that you can use at any time. And the digital piano also comes with headphones. Most of the time you want to have your personal studio headphones, but the ones included will do to start. To sum up, it’s a great digital piano model for a great price. You get quality, features, extra hardware, and a lot more. What else do you need? 54 keys is not a lot to practice with, but it will do great as your first keyboard ever. For how much it goes for on the market, you can’t really find the same quality for the cost. The digital piano comes with an LCD screen in order to help beginners stay on track and pick the right notes and chords when playing. Think of it as a smartboard that makes your life a little bit easier, that’s it. Isn’t 54 keys too little? It is not 88 keys, so you can’t do much when it comes to the classical and other advanced pieces. However, you can do the rest quite easily. It will take you months to start using the full 54-key digital piano. If you get to the point when you actually need more keys, then you can always upgrade, as RockJam wasn’t that expensive to start with. But this will take time. If you are a beginner, 54 keys will be enough for a long time. This digital piano doesn’t have anything special, but it does come with a few neat perks. For example, you get eight preset songs to practice anytime. Moreover, you can always take advantage of the record and playback buttons to track the progress as you get better with time. This will help you to improve your techniques over time. Black is not a big brand name you would know off the top of your head. Even if you do hear it, there is no way you can find a connection between the title and the products Black makes. Even though the management didn’t come with a better name for their musical instruments company, the quality is not lacking. It’s actually quite good. Is this keyboard good for beginners? It’s primarily made for people who want to play the piano but can’t afford even a budget Yamaha and Casio. You can say the sound quality is not as good, but it’s as close as you can get to the quality sound for the price you pay. 61 keys will do great for beginner to average piano players. LCD screen helps the pianist to find the note or the chord they are trying to play. It’s most beneficial when you haven’t built your muscle memory yet. Unfortunately, it doesn’t come with any rhythms, sounds, or presets. This is good for someone who is just getting the hang of the fundamental and doesn’t need any extra information to overwhelm themselves. You get a small music sheet attachment which is an extra piece that you would’ve had to purchase in the future otherwise. Other than that it’s just a budget and affordable digital piano for beginners. There are a few things you should consider before purchasing a digital piano so you can narrow your choices a little more. Clearly, you will want a warranty when buying something moderately pricey, such as a digital keyboard. Luckily, most places in Europe and North America offer you a decent manufacturers warranty already. However, it’s crucial that you read it if you are really concerned. Well, some of them will require you to ship it to their warehouse for them to take a look at your digital piano. You are already losing money on shipping. Especially if the warehouse is on the other end of the country and you package weight a ton a takes a lot of space. There is a chance that they won’t find it defective and will have to charge you more to ship it back. Long story short, you ended up losing money, time, and nerves. Always read the warranty if you doubt the manufacturer. With Yamaha and Casio, it’s a lot easier. If you’ve decided to cheap out just a tiny bit and settle for a cheaper digital keyboard brand, some issues may arise later if you are not careful. Reading the reviews is not always the best idea, as one negative review may impact your decision more than twenty good ones. That’s how people are wired. That’s why you have to be more objective when doing your research. Of course, if you see a one-star product, that’s alarming. However, if a digital piano has 1000+ reviews and 10 of them are bad, that’s not a big deal. Rely on stats, not on your feelings. On the positive side, reviews can show you the packaging and actual photos of the product and supply you with enough additional information to make the decision. Remember this when reading the reviews. When playing a key on the piano, a hammer strikes strings. This action makes them vibrate and make a sound which is also called a note. In the digital keyboard, manufacturers implement various spring actions to replicate the feel of a real piano. It won’t be 100% authentic, but over the years they’ve gotten really far. You almost can’t tell the difference. Some people want to start small and buy an acoustic piano at some point. If that’s your goal, it’s better to start learning to play the piano with your keys weighted so that the transition will be a lot smoother. If you don’t have such goals in mind, don’t spend more money because having weighted keys is “how it’s supposed to be.” It’s not a big deal these days, and the skills you build are still transferable. The commonly asked questions are answered. Hopefully, you’ve found the list helpful. There are tons of other digital pianos out there, but the ones on the list seem to be the best bang for the buck for everyone. If you haven’t started learning piano or have begun recently, it’s a good idea to have something guiding you. For example, an e-book, a course, etc. Speaking of courses, you should look into PianoForAll. The course includes 200+ videos and 9 step-by-step e-books that will guide you from the very fundamental to the advanced techniques. All the lessons are downloadable and available offline after that. Moreover, they are suitable for any device. And you get the lifetime updates and support while only paying the one-time fee. Isn’t this great? Learn how to play classical and jazz music, ballads, and a lot more.! You know what? Visit their website and take a look yourself. In the meanwhile, check the sample of PianoForAll tutorial below!